Mike Portnoy is probably one of the best progressive rock drummers of all time. His huge success in the band Dream Theater has brought drummers from across the world to recognize his skill with the drums. Portnoy has had huge success in progressive rock with a number of bands, including one that he put together himself, “Liquid Tension Experiment”. As a graduate from Berklee Music Institute, Mike has had his share of education with rhythm and percussion. A master of odd time signatures and double bass drum fills, Mike Portnoy is definitely a drummer to be recognized. 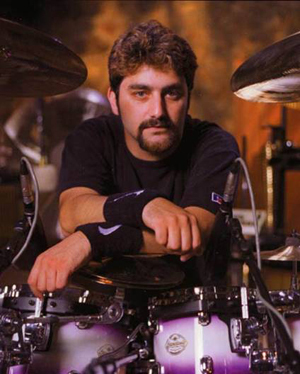 Mike Portnoy was born on April 20, 1967 in Long Beach New York. His father worked as a radio DJ for a local radio station. This is where Portnoy got most of his early music appreciation from. He started out liking Led Zeppelin, The Who, Queen, The Beatles, and more. Mike never really had any drum lessons early in his life, he basically taught himself. During his high school years, he played for local metal bands such as Rising Power, Inner Sanctum, and Intruder. Inner Sanctum eventually created an album. During his years of playing with Inner Sanctum, Mike received a scholarship to Berklee Music College that he couldn’t pass up. It was in Berklee College where he met good friends John Petrucci and John Myung. This group of three went on to form the band Majesty – a progressive metal band. Through ups and downs, the band had a fairly large fan base in the progressive rock genre. However, it wasn’t until 1999 where the band met keyboardist Jordan Rudess, before they really took off. By this time, the band changed its’ name to Dream Theater, and had a very large fan base. Mike Portnoy's popularity grew due to his unique drumming style and fast double bass drumming chops. Apart from his massive success with Dream Theater, Mike Portnoy has also had many other achievements. The biggest has got to be his enrollment into the Drumming Hall Of Fame. In fact, Mike Portnoy is the youngest drummer in history to be placed in the Drumming Hall Of Fame – quite the achievement. Along with this, Mike Portnoy has won 20 awards with Modern Drummer Magazine. These include Best Up and Coming Drummer, Best Educational DVD, Best Recorded Performance, and Best Progressive Rock Drummer. Mike has made 2 instructional movies, both in which are very popular. His most recent one, “Liquid Drum Theater”, has won awards from Modern Drummer. Mike has met many famous drummers, including child hero Neil Peart. Mike Portnoy has been involved in many bands besides Dream Theater. He has been a drummer for many cover bands, like his Beatles cover band he started. He has also covered for many different bands that need a replacement drummer. Mike Portnoy created a super band called Liquid Tension Experiment. This included some of the best musicians around the world. Mike is by far a very versatile drummer. Mike has played on many kits in his life. He is currently signed with Tama, and has been playing Tama drums for many years now. There are too many different kits that Portnoy has played with this band Dream Theater to list. He has a number of big kit set ups that he has named in his life time. Some of these are: Yellow Matter Custard kit, The Purple Monster, Transatlantic kit, the Hammer of the Gods, and The Albino Monster. He has used a Mapex drum kit for some of his recordings, but mainly sticks to Tama. Portnoy is recognized for his huge drum kit setups, including 2 bass drums, many toms, and a very large selection of cymbals. Mike is currently signed with Sabian cymbals. All in all, Mike Portnoy is definitely a drummer you should know and study. Most common drummers can easily relate to Portnoy’s chops due to his style. A definite leader in the Progressive metal rock music genre. Although Mike may not be as technical as others, his playing is far from basic, with chops that are sure to impress you! There are many drum videos of Mike Portnoy at the drum videos website.